Magnetotactic bacteria are able to biomineralize magnetic crystals in intracellular organelles, so-called “magnetosomes.” These particles exhibit species- and strain-specific size and morphology. They are of great interest for biomimetic nanotechnological and biotechnological research due to their fine-tuned magnetic properties and because they challenge our understanding of the classical principles of crystallization. Magnetotactic bacteria use these highly optimized particles, which form chains within the bacterial cells, as a magnetic field actuator, enabling them to navigate. 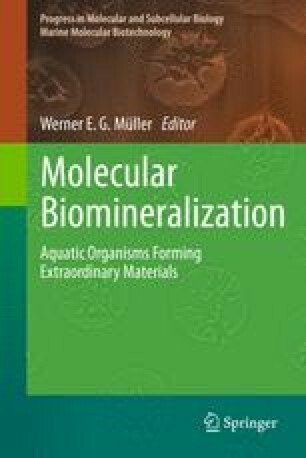 In this chapter, we discuss the current biological and chemical knowledge of magnetite biomineralization in these bacteria. We highlight the extraordinary properties of magnetosomes and some resulting potential applications. Prof. Müller is acknowledged for inviting us to contribute to this book. We thank Nicolas Menguy for the TEM images of magnetosomes in Fig. 1.3. The authors want to thank Prof. Fratzl for offering them the opportunity to join his department. Discussions with current and older group members were appreciated. Corrections and suggestions on the chapter by Kevin Eckes and Matthew Harrington are acknowledged. Research in the laboratory is supported by the Deutsche Forschungsgemeinschaft (DFG), the European Union, and the Max Planck Society.